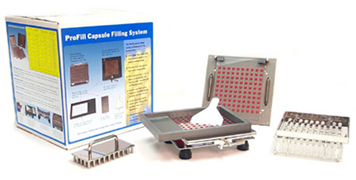 Capsugel's ProFill Capsule Filling Machine utilizes an advanced design for fool-proof manual filling of two-piece capsules. With the ProFill machine, there is no need for expensive capsule filling equipment and electrical/vacuum connections. Capsugel's new ProFill Capsule Filling Machine utilizes an advanced design for fool-proof manual filling of two-piece capsules. With the ProFill machine, there is no need for expensive capsule filling equipment and electrical/vacuum connections. The ProFill comes fully equipped to handle one capsule size; by adding inexpensive size change parts you can fill additional capsule sizes. This convenient unit is simple to use and easy to clean. It manually fills 100 capsules per cycle, and can produce up to 1,500 capsules an hour.